NJCCN works on behalf of nurses to provide evidence-based recommendations regarding the nursing workforce and its impact on patient care. The Center is housed in Rutgers University, School of Nursing, Newark Campus, and is guided by a 17-member board representing New Jersey nursing and healthcare stakeholders. 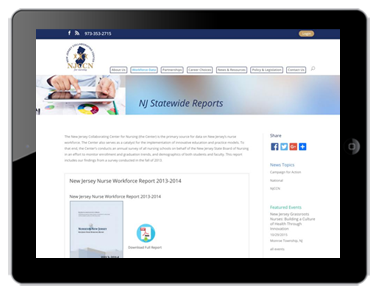 NJCCN wanted a dynamic nursing workforce center website that was interactive and informative. The current website did not meet the needs of the center. They publish a number of reports through out the year and wanted to make those reports available online in a simple easy to access format. They also wanted to be able to update the website with in-house staff. The target audience for the website is nurses, legislators and various government agencies. BZA worked closely with the NJCCN project team that consisted of staff members as well as other supporting nursing organization members. Through collaboration, together we developed the site structure and user interface. We integrated and configured several premium WordPress plugins that added functionality, including; events calendar, visitor polling, staff portal, donations credit card processing and more. One of the main functions of the website is the ability for users to locate NJ State nursing programs by category and locations. BZA achieved this function through the utilization of Google Maps API. BZA also provided personalize training for NJCCN staff so they can maintain the site. A new site is indeed a lot of work, if one takes the time and effort to do it right. For that you must work with a pro; BZA has been a pro. The site looks great and works very nicely.